Stamp Simply #40 Some Like It Hot!! When I saw this set my first thought was...Ice cold beer. The "Happy Father's Day" stamp took me to another place. Yummy chocolate root beer floats! As a child and a adult root beer floats are a family favorite! I decided to do Sharon's challenge for the mug, instead of beer I made a chocolate root beer float ( Father ). This isn't as yummy as the real thing but it sure brings back fond memories! If you look closely you will see this card is not perfect. Each detail is a bit off...according to the stamping standards:) But my how I remember making things for mom and dad at school!!! I poured my heart and soul into those things and they loved them uneven, not attached, written crooked, it was all about the love!! I collect elephants and my youngest daughter during art class in Jr. High made me several elephants with clay. She is 23 now and is totally annoyed those elephants are displayed proudly with all the others in the curio cabinet and entertainment center. I stamped the mug on dp and cut it out. 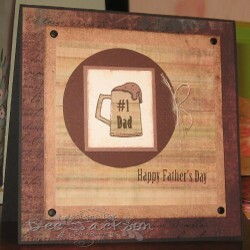 I stamped my #1 dad stamp on the cut out mug. The foam was stamped on close to cocoa paper and cut out. All stamps are Flourishes LLC. I used All in a row stamp set SU! for the piercing and a matpack. Hi there! I made this card for Sharon's Stamp Simply challenge. You can read all about it here. I've done very little paper piecing, so this was fun trying something different. I think one of the reasons I haven't used this technique in the past maybe because I don't have many stamps that lend themselve to paper piecing. 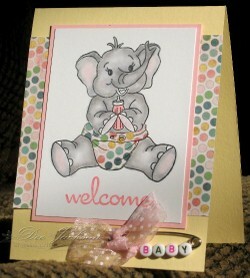 Lucky for me I have this adorable Baby Elephant stamp it's made by Peachy Keen Stamps. I used Basic Grey Two Scoops dp for the paper piecing. I got mine from Flourishes LLC. The welcome sentiment is from Kitchen Sink Stamps Never A Loss 4 Words set. 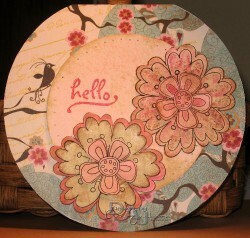 Flourishes has a new release today and Sharon's Card shows it off wonderfully. Make sure to check the other girls samples for ssnotime28. I'm sure you will find inspiration! Sharon's: Sharon made a wonderful card for dad!! Julie's : Julie did a amazing job cutting and piecing WOW!! Tammy's : Tammy even dressed the dog!! I'll be later with another up load as well as candy info. Until then enjoy! Another one bites the dust. Bye bye Time well spent! Wow I have lost so many sets to retirement here's another one. This is for Sharon's chellenge!! Use rounded corner's here's my take. I've never made a full circle layout card so this was fun! My mind kept saying rounded corner...i.e. round card! I'm not sure I'm correct but I sure appreciate you stopping by and playing with Sharon, Julie and I.Making me think out of my box!! I can't wait to see your take on this challenge! Thank you so much Sharon!!. Hi there! You have no idea how happy I am. Starting today I will be making one of the samples for Sharon Johnson's ( notimetostamp ) Stamp Simply Challenge every Friday. Thank you so much Sharon this is going to be a blast! Today's challenge is to use paper piercing on your card. 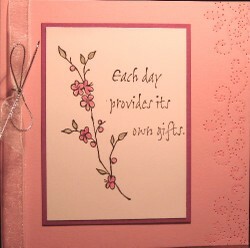 You can see Sharon's gorgeous card and read about the challenge here.